Well, I finally got my hands on it: Death of a President, the mockumentary that asks, what if someone went ahead and fulfilled the wish of two-thirds of the Earth's 6.6 billion person population and killed the 43rd President of the United States, George W. Bush? Well, apparently, it wouldn't make a very good movie. The draw to this film is obviously its sensationalistic premise, and as such, you actually expect a bit of cheese. But Death of a President actually tries to take the high road by giving us not a Hollywood-style assassination/who-dun-it, but a "realistic" treatment of this serious question. The result is singularly boring. The problem is that the movie can't seem to find its stride. Granted, kudos should go to British director Gabriel Range for not selling out with the president's car getting blown up by a suicide bomber or something silly like that, opting for a simpler and more realistic sniper scenario. But Range seems to have confused realism with banal unoriginality. While the handling of Bush's assassination can be applauded as tasteful, it makes the botched quality of nearly all the rest of the film painfully obvious. In fact, the rest of the movie is so much fluff, you almost wish Range would've sold out and at least given us some bang for our buck. Take the overly sentimental lead-in to the president's death, which takes approximately twenty-five minutes of actors over-acting to get to; there hardly isn't an FBI agent, secret service agent, journalist, or presidential advisor that doesn't get choked up during his or her interview. After the assassination, though, you really expect the movie to pick up steam. Not so. What follows are a predictable, lukewarm indictment of now-President Cheney's handling of the executive office and a played-out mistaken-identity twist in capturing the killer. Laughably, the movie closes "dramatically" with cliché updates typical of movies "based on a true story." This might've worked with a movie of superior quality ... even with the opening paragraph-long blatant warning that this film is fictional. It's the straw that breaks the gimmick's back, and you're left wondering, why did I just waste my time on this? 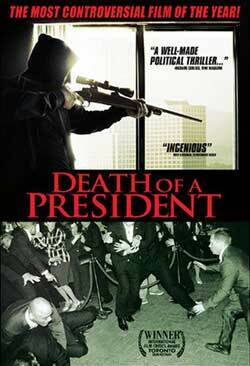 In all, Death of a President succeeds, through a mix of bad acting and a supposedly realistic yet uninspired plot, in killing a potentially good movie idea that could've been controversial and insightful, even moving. Instead, you're likely to come up with a more interesting scenario yourself if you simply read the movie title and let your imagination run wild with the dumbest half-baked plot you can think up.